Are any precautions before the treatment necessary? Do I need any investigations before the treatment? Can injection therapy of my veins be harmful? Does treatment of spider veins result in the appearance on new ones? Do I need to plan all my pregnancies before starting the treatment? Is laser treatment better than microsclerotherapy for spider veins? Injection sclerotherapy is a non-surgical method which was developed a long time ago with the aim to treat unsightly and damaged veins, such as the spider veins (or thread veins or venous flares) and the varicose veins of the legs. It is a safe and successful method. <¤> In smaller veins like the spiders, the technique of micro-sclerotherapy is used. Microsclerotherapy is the most effective treatment of spider veins of the legs. It is not suitable for spider veins at the level of the face. Nearly all people can have sclerotherapy with the exception of women who are pregnant, breastfeed or take contraceptives. A relative contraindication is anticoagulation therapy, history of venous thromboembolism, diabetes mellitus and serious bronchial asthma (on treatment with corticosteroids). <¤> For larger veins like the varicosities, a higher concentration sclerosant solution can be injected either as solution or mixed with air as foam sclerotherapy. In selected cases (relatively small varicose veins), foam sclerotherapy may be an effective method for the treatment of varicose veins. Depending on the size and the depth of the veins treated, it may be performed under ultrasound guidance. Sclerotherapy involves injetion of a sterile solution of a sclerosing agent (called the sclerosant) with a very fine needle in a vein. It does not require any anaesthesia, not even local. The sclerosant damages the internal lining of the vein walls causing irreversible changes so that the opposite walls stick together resulting in blockage of the vein and formation of a fibrotic cord (sclerosis). After the vein can no longer fill with blood, your body will eventually absorb it within a period of several months. We commonly use solutions of polidocanol (which is a detergent sclerosant). Avoid Aspirin and other non-steroidal antiinflammatory medications (Brufen, Mesulid, Naprosyn, Voltaren etc) as well as alcohol consumption for 2 days before the treatment. Do not use any creams or lotions on your legs for 24 hours before the injections. In some cases, duplex ultrasonography of the leg veins may be required to determine the extent of the disease of both the superficial veins (the ones found immediately under the skin) and the deep veins (the ones found between the muscle groups). Your vascular surgeon will decide at your initial consultation if you need this investigation. After a session of microsclerotherapy, there is commonly redness and some swelling along the veins. This may last for hours, days or even longer depending upon the size of the veins injected. In other words, the appearance of the veins will get worse before it gets better. Less often some bruising may appear. You are allowed to have normal activities immediately after a sclerotherapy session. During the following weeks or months, your body will gradually absorb the veins that received the injection. After a session of foam sclerotherapy, your leg is bandaged and placed in a full-length stocking for a week. The success of the treatment relies upon the pressure that the bandages and stocking apply to the injected area. The foam causes inflammation in the vein, which then shrivels up and gradually becomes less visible. Sometimes the inflammation can be uncomfortable for a few weeks, and occasionally the skin may blister and become scarred. You can walk, but you should not drive immediately following the treatment. Each treatment session takes 30-45 minutes and is an office procedure. We usually allow intervals of a few weeks between the sessions. If there are many veins, sclerotherapy sessions may be performed in shorter intervals. The total number of sessions will not be affected by the interval length. The number of injections per session will depend upon how extensive the unsightly veins are. Because there is limitation of the amount of sclerosant solution that can be injected into you in one session, you may need several sessions if there are many spider veins. 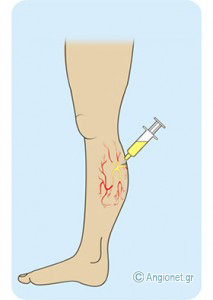 Usually a vein responds to one treatment; however, repeat injections may be required for a single vein. In some patients there is an instant result and other patients have to wait for up to three months for the veins to clear. Most patients require between 2-6 treatment sessions and will see a 50-80% improvement of their spider veins after them. Rarely do all the spider veins dissapear. The number of sessions required will be roughly assessed at your initial visits, but the treatment continues until you are entirely satisfied. You will feel completely normal following a session of microsclerotherapy, and you will be advised to take a 10-15 minute walk immediately afterwards and resume your normal activities. You may be given special hosiery to wear for a few days to a week. Avoid high impact excercise for 2 weeks, no sun exposure, steaming hot baths, showers or saunas for 2 weeks and no waxing for 4 weeks. If you plan a long haul travel in the next 4 weeks, discuss it with your physician before the treatment. Fortunately, serious complications after sclerotherapy are rare. Allergic reactions (hives, shortness of breath) are extremely rare with the agent we use. Perhaps the commonest complication is pigmentation along the injected vein looking like a brown line in the overlying skin. This is due to perivascular inflammation and haemosiderin deposition and its incidence ranges from 2% – 80% of cases. This pigmentation will nearly always disappear spontaneously, but it may take a long time. A small blister or bruise at the injection site may appear which will go away in a few days. Another complication is a red area of telangiectatic matting near the treated spider veins. This is probably due to neovascularization of treated tissues and occurs in ~16% of cases. If these new tiny veins do not go away, they may be treated with transcutaneous laser or/and further injection sclerotherapy. Much rarer complication may be a small ulceration eventually leaving a tiny scar, like a freckle, which will fade as time goes by. Other potential complications after foam sclerotherapy are temporary visual disturbance, deep vein thrombosis (DVT), headache and extremely rarely transient stroke. Spider veins, as well as varicose veins, are damaged veins, which do not function properly. Their removal is not only harmless, but it improves the venous circulation in the leg. From the moment these veins developed, the nearby healthy veins have taken over their work, i.e. to return of blood to the heart. The fact of vein removal itself does not cause the development of new spider veins. However, having spider veins shows that you have a predisposition for leaking valves in your veins, therefore, further spider veins will appear over time regardless of whether you had previous sclerotherapy or not. Some patients of ours choose to return in the future to undergo a further session of injections. The frequency is extremely variable. It is possible to repeat the treatments as often as necessary to achieve a very good result. After spider veins have been successfully treated, they do not come back. This is why it is reasonable that they are treated early. You do not need to finish with all your planned pregnancies before you begin treatment. However, this wrong impression is quite common. In fact, it is more reasonable to have treatment of your veins before pregnancy so that they do not get worse. Of course, new veins may appear in a subsequent pregnancy, but at least the veins already treated will never reappear. Obviously, you may need further injection sclerotherapy in the future. For small varices and reticular veins sclerotherapy has better results than any laser available today. For very small telangiectasias (less than 1mm) or certain other vascular lesions, laser therapy may be used.